I couldn't wait to complete this special feature on the fabulous Melbourne designer, Arabella Ramsay. Her eponymous label began in Arabella's bedroom, after graduating from RMIT and spending some time in Paris. She returned home to Australia, ever so inspired. Finally, once demands for her designs skyrocketed, Arabella opened up her very first boutique on High Street, Armadale. The year was 2006. 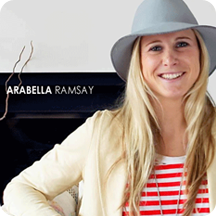 Fast-forward to 2012, and Arabella Ramsay is still going stronger than ever. Arabella Ramsay grew up on a farm, and her childhood memories of the animals, the land and her family, have become a great inspiration for her collections. The inspiration behind Arabella's The Apple of my Isle collection, stemmed from a recent trip to Tasmania, where she used posters from the 70's and unusual left-of-centre buildings in Hobart, as a basis for her designs. Arabella has included her family in her business, which I found to be really amazing. 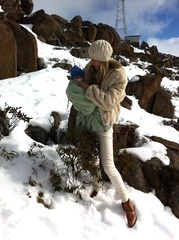 Her newborn, 'little sweetheart', Marlowe, is the name behind her creative prints. Arabella has integrated her father, Dougal Ramsay's, illustrations of Australian feral animals and dogs into garments, such as bamboo jersey leggings and tees. Arabella has introduced a new second line, she aptly calls, her 'little sister' label , Ryder. Ryder is a more affordable line and focuses on effortless everyday style. Arabella draws inspiration from her childhood memories of living out in the Australian outback. Her carefree nature and experiences of wide, open, endless land, have been captured perfectly in the style & design of the clashing patterns, colours and fun, flirty styling. Go to this link to view the Ryder range -You cannot click on this as it is just an image! During a recent runway event held at Myer, Melbourne, Arabella Ramsay showcased her new Autumn/Winter '12 collection. 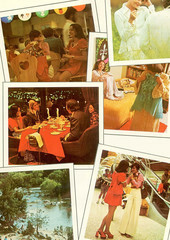 The flowing skirts and sweet blouses, with peter pan collars, crochet sweaters, amidst flannelet, drew me in immediately. My favourite pieces are the mustard skirt (available in April) and blouse with peter pan collar in navy. I adore this ensemble & would love to have it in my wardrobe some time soon. I'm also a fan of the blue cotton crochet sweater and white blouse. Very cute! If you live in Melbourne, pop into Arabella's store in Armadale to check out her collection, or, alternatively, explore her website using this link. I am looking forward to going into her store very soon to check this collection out for myself. I cannot wait!! Photos courtesy of Arabella Ramsay. Thanks for your comment! I'll check your blog out too. I absolutely love this chic designer's work, it seems like it'd be such an effortless body of pieces to wear! Beautiful. Arabella is quite a talent, that's for sure. Piecing her garments together does seem effortless. I'm looking forward to seeing the collection for myself.